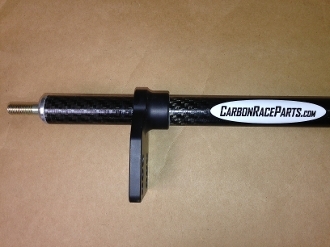 Kart Carbon Steering Shaft, the last steering shaft you will ever buy. How straight is your steel steering shaft? One minor on track bump will ever so slightly bend steel shafts throwing your ackerman settings out the window causing un-symetric steering geometry even though the alignment is set correctly static. Get the only steering shaft on the market that is guaranteed not to bend for life. 62% lighter than steel shafts. Weighs 228 grams (8.2 oz). Specify dimensions, overall length and offset in pull down click on "click to enlarge" photo for dimensions if the dimensions are not listed specify "custom" every shaft is custom built to order per your specs. 100% hand made in the USA.